Yesterday, the 6th of January, was Epiphany, the last day of Christmas. 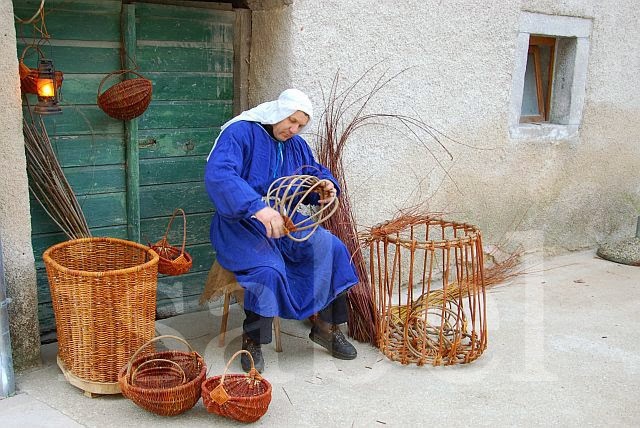 Also known as Three Kings Day, this is a national holiday in Croatia. I liked the fact that the Christmas holidays here extend to January 6th – I had always hated going back to work on January 2nd – here Christmas lasts for the full twelve days, which seems very civilized! I remember my mother observing the Epiphany holiday and telling me that when she was a child they would call it ‘little Christmas’. In Belgium and Northern France, a special cake is eaten on this day called the galette des rois. Children love it because a small ceramic token is hidden in the cake, and the person who finds it gets to be ‘king’ for the day and wear the paper crown which comes with these cakes sold in bakeries for this occasion. 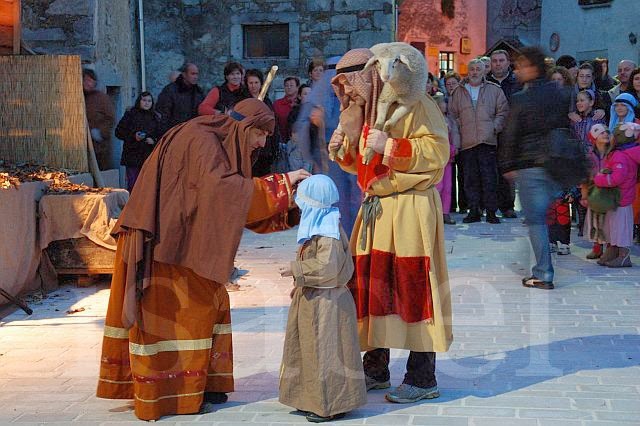 Here in Gračišće, the holiday was celebrated with a ‘live’ manger scene where the village’s residents dressed up and enacted the nativity story. This was a repeat of the same event which took place on December 26th but unfortunately had become a ‘non-event’ because of the bad weather. So everyone was hoping that the rain would stay away on Epiphany day, and indeed it did. A stable had been built next to the church’s bell tower where the manger scene was set up (which included several sheep and donkeys! 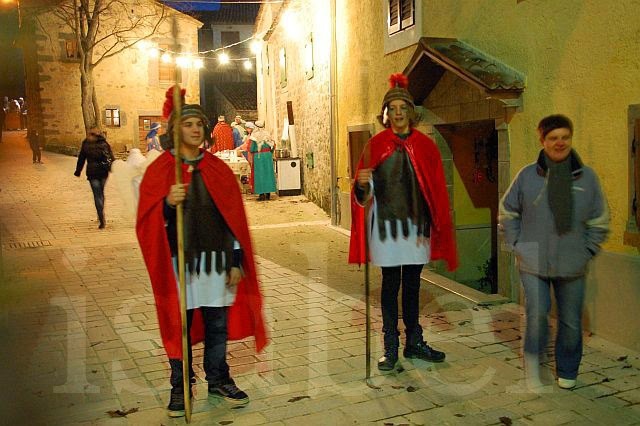 ), and along the lanes leading from the village square to the church, there were small stands with people dressed up in period costumes - or as close to ‘Roman’ dress as their imaginations would take them!. 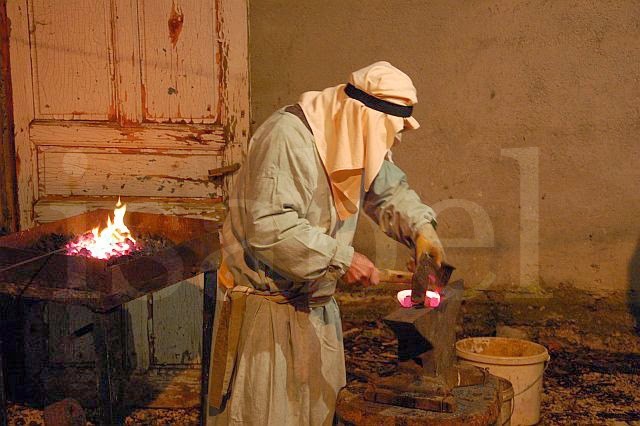 Some were enacting traditional trades and crafts – and many were skilled craftsmen who used to work at these traditional trades: there was a basket weaver, a blacksmith, a barrel-maker, as well as millers and carpenters. It was fun to see our neighbours dressed up in this way. Scenes from the nativity story were sung by a small choir as a young couple (who had recently had a baby!) dressed as Mary and Joseph made their way through the village, looking for a place to spend the night but being turned away. Finally an innkeeper made some space for them in the stable. Baby Jesus was actually a baby girl, but this didn’t matter, and she managed to somehow sleep peacefully as people crowded into the stable to have a closer look at the live nativity scene. 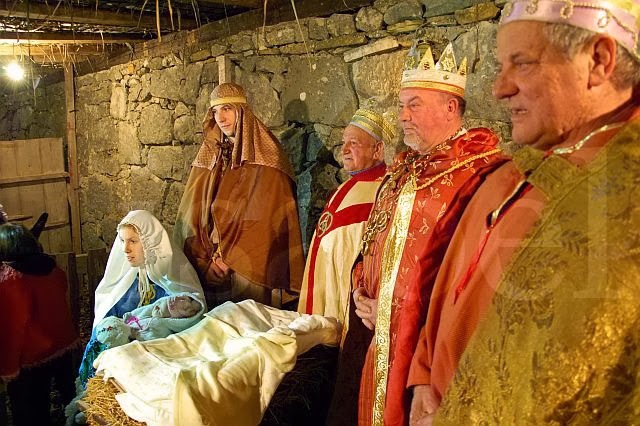 The Three Wise Men of course soon arrived bearing their gifts of gold, frankincense and myrrh, with the village mayor as Balthazar. Now that the twelve days of Christmas are over, life goes back to normal. For many people today was the first working day of the year, and this morning I saw the Christmas lights being taken down. In keeping with tradition, I’m also taking down the decorations I had put up on this blog! Ha ha, a very good guess!